I know I’m only perpetuating this, but I finally got a super shot of the little winged terror this morning. CityTV did show the clip again last night but didn’t include Chris’s interview. But my neighbours made it on. Guess they made for a more interesting interview. Oh and it’s posted as a “top story” on CityNews’s site. Ha! Guess they’re looking for a little “fluff” to help lighten the news cast, what with all the flu, the collapse of the auto industry and the economy in the toilet and all. Fun, fun! 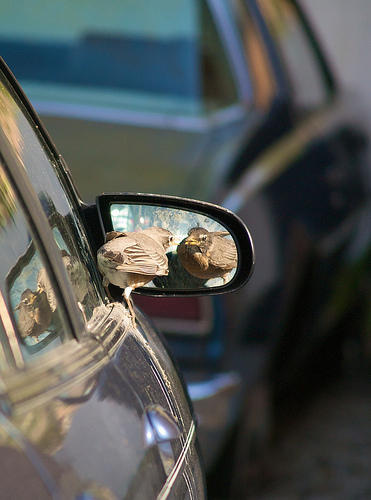 Great shot, with 1 bird and 3 reflections! The poor little guy is SO confused!